Why will they be rejected in spite of their devoted worship and ministry in the name of Jesus? It has caused some people almost to despair of salvation. How can one know that his own religion will not finally be found in this category? Let us seriously look for the answers to these questions. Our salvation does not depend upon our sincerity, but upon finding the truth in God’s Word and obeying it! The first point we must understand is this: RELIGIOUS ACTIVITY IS QUITE USELESS IF WE ARE NOT DOING THE WILL OF GOD. Christ declared that calling on God’s name, and even leading out in great selfless humanitarian programs, will be wasted if obedience to God’s will is excluded. Mark this fact upon the table of your mind and never forget it—the Scriptures exalt OBEDIENCE as the distinguishing test of a valid religion. Those who engage ever so fully in the preaching of the name of Jesus—with time, talent, and money—and do not keep His commandments, cannot meet the approval of God. In fact, because they are not obeying Christ, such worshipers actually open a door by which Satan can enter unrecognized and work miracles through them, IN THE NAME OF JESUS, which they ascribe to the power of God. The plaintive plea, “Have we not prophesied . . . and in Thy name cast out devils?” is proof positive that their miracles had been done by some other power than that of Christ, albeit in His name. If Jesus never knew them, who else could work such miracles? Only Satan. The Bible speaks of “the spirits of devils, working miracles” (Revelation 16:14). Now we begin to see how simple it is to test the religious spirits that are in the world today. It is time that we look past the stimulating music, the spellbinding oratory, and even the exciting witnessing programs and apply the test set up by the great Author of all truth—Jesus Himself. He made it exceedingly clear that the original requirements of God have remained unchanged. The condition of obedience which would have kept man in Eden becomes the condition for his restoration to Eden. “If ye love me, keep my commandments” (John 14:15). We must not fail to emphasize at this point that element of love which must also attend all acceptable obedience. Forcing the forms of compliance without a personal love-experience with Christ the Savior is fully as fatal a mistake as omitting all obedience. Jesus had to deal with the cold formalism of the Pharisees over and over again. And because He so thoroughly condemned the program of salvation by works, many have hastily assumed that He considered obedience unimportant. Now we need to see the beautiful balance in Christ’s doctrine of faith and works. He taught that obeying in order to be saved is the worst kind of legalism, but obeying because we are saved is the acid test of a true religious experience. Obedience follows true faith just as surely as day follows night. Incidentally, the word “legalist” has been thrown around with too much abandon. I greatly fear that many sincere Christians have been accused of legalism only because their love for Christ led them to be more particular in their obedience than their accusers. Never forget that a legalist is one who believes that he can be saved by his works. The person who keeps the commandments because he doesn’t want to displease the God he loves is not a legalist at all. The old argument is often heard, “I’d rather see a happy, loving Christian who doesn’t keep all of the commandments than to see an unloving one who strictly obeys the law.” Why try to measure degrees of guilt? Both are completely wrong. Our feelings have nothing to do with it. Christ has established the standard of measurement. Nothing less than a “faith which worketh by love” will be accepted. But let us return to the alarming proposition that most of mankind will be lost, including the fervent religious activists. Worship is commanded in the Bible and is a necessary ingredient of true religion, but will a host of worshiping Christians be lost? Jesus said, “But in vain they do worship me, teaching for doctrines the commandments of men” (Matthew 15:9). Another shattering statement of truth! People will engage in vain worship if they reject true doctrine in favor of man’s tradition. On several occasions Jesus urged the necessity of walking in all known truth. “If I had not come and spoken unto them, they had not had sin: but now they have no cloak for their sin” (John 15:22). “If ye were blind, ye should have no sin: but now ye say, We see; therefore your sin remaineth” (John 9:41). When a man learns a point of truth in the Bible and refuses to obey it, he is guilty of practicing sin. Such a man is fighting the Holy Spirit whose primary work is to guide into all truth. This refusal to obey hardens the conscience, causing the Holy Spirit to finally withdraw and leads to the unpardonable sin. No wonder such worship is vain. By rejecting the commandments of God in favor of human traditions, the Holy Spirit is spurned. According to Acts 5:32 only those who obey are eligible to be filled with the Spirit. In view of the deep-rooted tradition of popular Christianity today, we can see how Satan has manipulated millions into a state of mind to reject the claims of God’s moral law. Under the twisted interpretation of a cheap grace (someone has called it “sloppy agape”) the stage has been set for the devil’s master strategy of deception. The final contest between truth and error will revolve around the basic issue of loyalty or disloyalty, obedience or disobedience. And the focus will be squarely on the fourth commandment which contains the great distinctive sign of God’s creative power and authority. It seems more than coincidental that Jesus spelled out “traditions of men” as the false doctrine that would lead into vain worship. The chief tradition today which has turned multitudes from keeping the Ten Commandments is the doctrine of Sunday-keeping. Almost any Christian of any persuasion can defend and extol nine of the Ten Commandments. It is only the Sabbath which has stirred deep hatred and prejudice against the holy law of God. 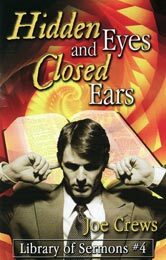 The priests of the Old Testament hid their eyes from the Sabbath and the ministers of the last days would turn their ears from the truth. How tragic! In other words, they would see it but would try to get away from it by refusing to keep looking. I have often talked to ministers of various persuasions on the subject of the Sabbath. Some have honestly admitted that Saturday is the true Lord’s day of the Bible. Others reject it for various reasons. A few just could not believe that God was so particular about which day to observe. They reasoned that God would be understanding with those who found it more convenient to keep a different day than the seventh day. Some ministers that I talked with do not really accept the Bible as the inspired Word of God. It is shocking to realize how skepticism and higher criticism have robbed many pastors of their faith in the Bible. Even many of the old-line conservative evangelical denominations are becoming riddled with doubts about the inspiration of the Scriptures. Often that is used to justify their rejection of the Sabbath. In one Amazing Facts crusade I spent an interesting afternoon with a Southern Baptist minister who had requested an interview on the Sabbath subject. Some of his members were attending the Amazing Facts crusade and had questioned him about what they had learned. For the first time in his life he delved into the subject in order to find answers for his people. Then he asked me to meet him in his church office. I listened in amazement as he explained why he could not accept the Sabbath. I was amazed because the Southern Baptists have had the historic reputation of being fundamental, Bible-believing Christians. But this young man, who graduated from the Louisville Southern Baptist Seminary in 1975, did not believe in the Genesis story of creation. He denied the flood story and affirmed his belief in evolution as the explanation of man’s existence. He explicitly rejected the story of Jonah and the whale. Finally, I asked him if he believed in the virgin birth of Jesus. His answer was, “I don’t believe it is necessary to believe in the virgin birth to be saved.” I wish I could tell you that this attitude is exceptional among the Baptists, but it is not. This pastor assured me that over half of the Southern Baptist ministers believed just like he did. I certainly hope he is mistaken about that estimation, and I’m frankly of the opinion that he was exaggerating the numbers. Nevertheless, I’m convinced that the majority of this young preacher’s classmates had lost their faith in the inspired Word while studying at the seminary, just as he had. Finally, under close questioning, he weakly affirmed some kind of personal faith in the virgin birth even though he didn’t think it was too important. I asked him if his congregation knew about his views on the Bible, and he assured me that they did not. He did not dare preach the things that he believed. I said, “Dave, if your church knew what you have expressed to us, they would fire you on the spot.” I could understand perfectly why he was afraid to preach his convictions. It should not be too great a surprise to see this wave of skepticism growing. Basically, it is one of the signs of the end of time. We are watching prophecy being fulfilled before our eyes. What I have just told you is only one of the dramatic signs that Jesus is coming very soon. Do you wonder how the seminaries and great denominations have drifted into this sort of open doubt of the Word of God? One reason is obvious. By denying the Sabbath they opened the door to doubts about the literal six-day creation. Another easy step led to the vast periods assigned to evolution. God gave the Sabbath as a divine reminder of His sovereign creative power. Representing His authority as the only true God, the Sabbath was to be a weekly reminder that the only God deserving of worship is the One who alone had the power to create and recreate. As a sign of both creation and redemption, observance of the Sabbath would be a perpetual protection against the evil of evolution as well as modernism. When the churches rejected the Sabbath, they also rejected the strongest bulwark which would have protected them from the kind of deadly disbelief which the young minister expressed. No man can be an evolutionist or a modernist who truly believes and keeps the Sabbath. This state of confusing doubt is also the fruit of antinomianism which has been so widely espoused. By trying to do away with the moral law of the Ten Commandments, the churches have compromised the doctrine of an infallible Bible. If the Sabbath can be explained away, if the great basic moral law can be nullified, then almost any other part of the Bible can be rationalized. And it has been, by millions who were taught to do so by the preacher behind the pulpit. Closing this subject, I would like to trace one chain of such prophecies, all links of which are related by a common symbol. I want you to notice the connecting thread which is picked up by both major and minor prophets and woven through their writings. The chief symbol of God’s law seems to be that of a wall, and it is used extensively throughout the Old Testament. Isaiah dramatically represented disobedience to the law as a break in the wall. “This is a rebellious people . . . children that will not hear the law of the LORD . . . Therefore this iniquity shall be to you as a breach ready to fall, swelling out in a high wall” (Isaiah 30:9-13). Here God rebukes the spiritual leaders for not making up the gaps and breaches in the wall. As the watchmen on the walls they were to be the very first ones to notice any weakness and to warn of the break immediately and make restoration of the defenses. In this case, not only were the priests not making proper repair of the breach but were condoning a dangerous substitute of weak materials which God could not approve. The untempered mortar represents an effort to gloss over the seriousness of the defect by false teaching instead of leading the people back to full obedience. Repeatedly God had to warn the priests against weakening the authority of His law. Malachi warned the priests: “Ye have caused many to stumble at the law . . . ye have not kept my ways, but have been partial in the law” (Malachi 2:8-9). It was such an attitude that caused God to rebuke them for daubing the wall with untempered mortar. Does the Lord indeed approve of this unholy tampering with His perfect law? Jesus said, “In vain they do worship me, teaching for doctrines the commandments of men” (Matthew 15:9). No amount of daubing with foreign, untempered material can make the wall whole again. Only the restoration of the original material, the seventh day of the week, can satisfy the great plumbline of God’s scrutiny. He is the Author of that law—the builder of the wall—and He will accept nothing less than the full original strength and proportion. “Thus he showed me: and, behold, the Lord stood upon a wall made by a plumbline, with a plumbline in _his hand. . . . Then said the Lord, Behold, I will set a plumbline in the midst of my people” (Amos 7:7, 8). A plumbline is used to determine the exact straightness of a wall, and God will measure His people by His holy law. Jesus declared that even worship is vain and empty when the commandments of men are taught instead of His commandments. “Thus have ye made the commandment of God of none effect by your tradition” (Matthew 15:6). Someone may object that we are taking verses out of context and that the wall symbol does not refer to God’s law in these modern days. The prophet Ezekiel indicated that the counterfeit wall would be daubed with untempered mortar in the last days, and that the seven last plagues would bring its total destruction. “Say unto them that daub it with untempered mortar, that it shall fall . . . and a stormy wind shall rend it” (Ezekiel 13:11). Does the Bible give us any information about the time of this great deluge of hail? John the revelator describes the event in these words: “And there fell upon men a great hail out of heaven . . . and men blasphemed God because of the plague of the hail; for the plague thereof was exceeding great” (Revelation 16:21). Here is evidence that the false wall of tradition will be dealt with at the time of the seven last plagues. God speaks of that judgment on the wall as “my wrath” in Ezekiel 13:14-15. “So will I break down the wall that ye have daubed with untempered mortar . . . and it shall fall, and ye shall be consumed in the midst thereof. . . . Thus will I accomplish my wrath upon the wall and upon them that have daubed it.” What is His wrath? God refers to the seven last plagues as His wrath: “Seven angels having the seven last plagues; for in them is filled up the wrath of God” (Revelation 15:1). Do you get the picture now? His wrath in the destruction of the counterfeit wall is accomplished by the overflowing hail, which is one of the last plagues, also designated as God’s wrath. This places the judgment on the wall-daubers at the end of time when the seven last plagues are poured out. But how can we be sure that this untempered mortar is truly the tradition of Sunday worship? In case there is any doubt remaining on this point, please weigh this final proof. The wrath of God falls ONLY upon those who have the mark of the beast. “If any man worship the beast . . . and receive his mark . . . The same shall drink of the wine of the wrath of God” (Revelation 14:9, 10). Now let’s do some reasoning together. The facts of God’s Word are before us. Since the seven last plagues fall only upon those who have the mark of the beast, and since the counterfeit wall-builders receive the plagues, we have to conclude that the wall-builders have the mark. We have already shown that the Sunday tradition was used in the daubing. Does this mean that Sunday-keeping is connected with the mark of the beast? Indeed it does. For a full explanation of this fascinating connection, write for the free booklet, The Beast, The Dragon, and The Woman. Even without looking into the subject any further we can see that those who daub the wall (change God’s law) are Sunday advocates and that they also receive the plagues which fall ONLY upon those who have the mark of the beast. One would have to be blind to miss the fact that the mark is tied closely to Sunday-keeping. Let us now pursue the wall symbolism further in the writings of the Old Testament prophets. God was deeply concerned about the gap or breach that had been made in His law. He is quoted as saying, “And I sought for a man among them, that should make up the hedge, and stand in the gap before me” (Ezekiel 22:30). In view of the diversionary tactics of daubing tradition into the breach, creating a false wall, God is represented by the prophet as searching for someone who will “make up the hedge” and “stand in the gap.” What a picture is presented here! Did God find those who would have the courage to restore unpopular truth? Does the Bible finally describe the faithful rebuilding of the wall to meet the specifications of God’s plumbline? Let Isaiah take up the thread now and paint the final picture. “And they that shall be of thee (of God) shall . . . be called, The repairer of the breach, the restorer of paths to dwell in. If thou turn away thy foot from the sabbath, from doing thy pleasure on my holy day; and call the sabbath a delight, the holy of the LORD, honorable . . .” (Isaiah 58:12, 13). Here, without any equivocation, we find a clear description of those who will repair the breach and restore the original wall. It is those who turn back to the true Sabbath, and who enter into the work of clearing the debris of tradition, so that the Sabbath may again glow as the delight of God’s people—a holy day and honorable. Freed from the false allusions cast by antinomians and libertines, the law of God will be recognized as the great moral standard of grace-saved Christians—evidence of a genuine love relationship with Jesus. Gathering up these golden threads of Bible truth, we can summarize the prophetic story very easily and quickly. In the last days great thrusts will be made by false shepherds to weaken the authority of God’s law. Influential religious groups will join forces to lead people to reject the true Sabbath. By setting aside the fourth commandment, a breach is made in the law which is represented as a protecting wall. While counterfeit material is used to restore the gap in the form of Sunday worship, God finds a people who will be called the repairers of the breach and who turn back to keeping the true Sabbath. Those who try to change His law by substituting the pagan day of the sun receive the mark of the beast and experience the punishment of the seven last plagues. But let us close this discouraging prophetic picture on a note of hope and assurance. Not all will be found tearing down or trying to change God’s law. In the book of Revelation God points out His saints and describes them in these words: “Here is the patience of the saints: here are they that keep the commandments of God, and the faith of Jesus” (Revelation 14:12). A remnant will not go along with the traditions of men. They will not accept any substitute for the requirements of God. As the last end-piece of the apostolic church, they are characterized by loving Jesus supremely and keeping His commandments. Satan’s final desperate battle against God will take place over the loyalty of this little group. Here’s the way John viewed that clash: “And the dragon was wroth with the woman, and went to make war with the remnant of her seed, which keep the commandments of God, and have the testimony of Jesus Christ” (Revelation 12:17). May God grant you the courage to be a part of that remnant church which has the faith of Jesus, the testimony of Jesus, and keeps all of His commandments. These truly may be designated as the saints. In summary, note how link upon link of related texts show the fortunes and misfortunes of the wall—God’s law.